You must know as much about motherboards (aka mainboards) as possible in order to be able to understand how a desktop or laptop PC is configured and functions. The image above shows an MSI K8N Diamond Plus motherboard. The specifications provided by seller websites, such as Amazon, often do not provide all of the information that purchasers want to know. When I updated this page, Intel’s LGA-1151 processor socket was mainstream. Click on the link below to visit the page on Amazon that deals with the 76+ questions that purchasers asked about the “MSI Intel B250M Gaming Pro 7th/6th Gen USB2 Motherboard – Black (Intel Core i3/i5/i7 Processor, LGA 1151, Dual Channel DDR4, USB 3.1, PCI-E 3.0, PCI-E x1, SATA 6 GB).” that has a micro-ATX form factor (M-ATX), which means that it is a reduced-size ATX motherboard. For example, it only has enough space to provide two DIMM memory slots instead of the four slots that a full-size ATX board provides. The images below show an ATX case with a transparent side and an ATX motherboard installed in an ATX case. An ATX case can accommodate a micro-ATX motherboard. Desktop PCs mostly use ATX motherboards. 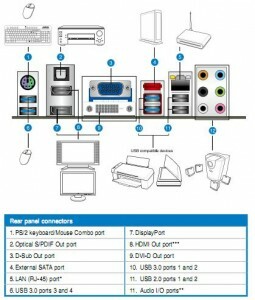 The motherboard manufacturers provide a user manual for each model that comes with a new motherboard. It provides all of the information on that make/model of board, including how to connect the power supply, install the internal components, such as the RAM memory, processor, drives, etc. If you buy a brand-name PC you need to identify the make/model of its motherboard in order to obtain a user manual from its manufacturer’s website. Alternatively, you can use a free tool, such as the Belarc Advisor or CPU-Z or Speccy. The link below provides the download page for the motherboard of the Asus Sabertooth X99 Intel Socket 2011 motherboard. Choose the language you want to download the file in the PDF format that requires a free PDF document reader. You can save it to read at your convenience. 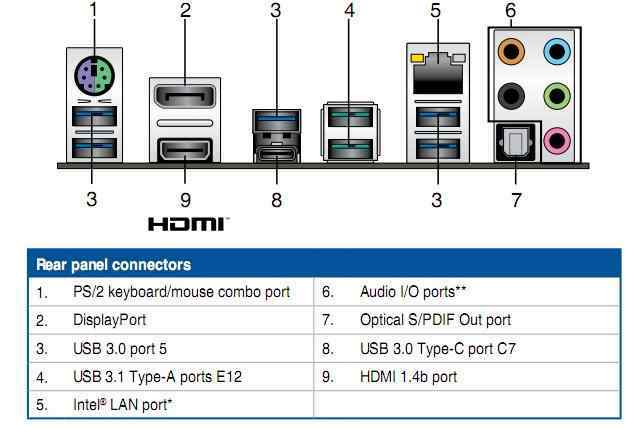 The image below shows the connection ports of an Asus F1A75-V Pro Socket FM1 motherboard from 2011 that appear at the back of the case and the devices they connect, including the built-in audio ports used by the motherboard’s sound chip. In March 2017, the Asus Prime X370-PRO motherboard has no USB 2.0 ports. 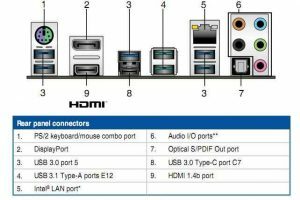 There is a single USB 3.1 Type-A and a single USB 3.0 Type-C port. The HDMI port of the board from 2011 is replaced by an HDMI 1.4b port on the 2017 board. Another improvement are the LED indicators on the LAN port that indicate activity (Off – no link – Orange – linked – Orange blinking – data activity) and connection speed (10 mbps – Off – 100 mbps – Orange – 1gpps – Green). The speed (frequency) of PC processors is now measured in GHz (gigahertz). Note that anything measured in Hz (hertz) or MHz (megahertz) or GHz is measuring its frequency, not its speed – the term that is often used instead of frequency. In electronics, when the frequency is increased, the electronically generated wave pulse isn’t actually going any faster – it always approaches the speed of light – it is just able to carry more data, because the wave is compressed as the frequency of the wave increases. There are more up and down cycles per metre, so the higher the frequency of a wave, the more data it can carry, in much the same way as compressed print can place more data on a page. Note that the design of the processor is just as important in determining its operating speed as its frequency. For many years, AMD processors operated at slower frequencies than Intel processors, but came close to Intel’s operating speeds by having more efficient designs. 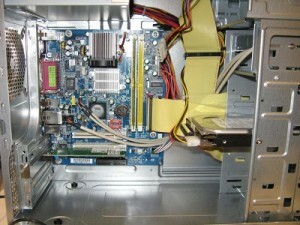 In all desktop PCs that have a standard ATX or micro-ATX PC case, the two most common sizes, you can replace or upgrade the motherboard, but you cannot buy new laptop motherboards from computer shops – retail high street shops or online stores. The miniaturised motherboards used in laptops provide most of the same features as desktop-PC motherboards but usually have fewer ports of any one kind due to the lack of space from which to provide them. The type of motherboard being used by a particular kind of computer is designated by its form factor. All of the form factors are dealt with on this website – formfactors.org. The main form-factor motherboards in use are ATX and micro-ATX that are fitted into mini-tower (aka micro-ATX), midi-tower and full-tower ATX cases. Both full ATX and micro-ATX motherboards are powered by ATX power supply units (PSUs). Mini-ITX motherboards are used in mini PCS and housed in small ITX cases. These PCs have very limited upgrade potential due to the small size of the board. The processor is usually soldered into the board instead of being fitted into a socket and so can’t be replaced in the usual way of taking the processor out and putting a new one in. Someone with soldering skills could probably replace the processor. 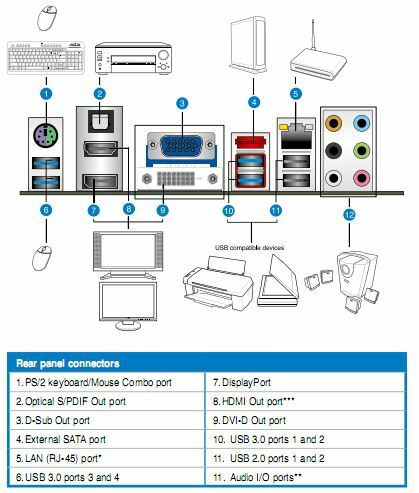 Currently, PCI (old technology still in use) and PCI Express slots on the motherboard are used for adapter cards – graphics cards, sound cards, network cards, etc. The PCI standard has been in use for several decades now and is still in use, but the PCI Express standard is used for the latest graphics cards. The PATA IDE standard used to be used for hard-disk and CD/DVD drives, but it has been replaced by the SATA standard, which has reached version 3.2 (Sept. 2014). Internal hard-disk and optical CD/DVD drives work perfectly well using a motherboard’s SATA and SATA 2.0 ports. They work on but can’t use the maximum data transfer speeds provided by the SATA 3.0 standard, which can only currently be used to the full by SSD drives. SATA is a backward-compatible standard, which means that a device designed for a higher version will work on a lower version but only at the lower version’s data-transfer speed. You should always make sure that a power supply that is provided with a case or a new PC desktop is a quality unit capable of delivering its stated maximum power output (400W, 500W, 600W, etc.). If you install, say, a 1000W unit and the components only need, say, 600W, they won’t use any more than 600W because the power supply is capable of providing 1000W. Most PC cases bought new don’t come supplied with a power supply unit (PSU) and when they do it’s usually not one worth having. I am fond of the Corsair brand of case and power supply. They are not too expensive and are usually very reliable. If you are going to buy your own power supply, you don’t have to spend a fortune on a case, just buy one that can accommodate the components that you intend to install in it. The power supply unit installed in inexpensive PCs and cheap cases is almost always a cheap, low-quality unit that should be replaced for the good of the computer, which can be destroyed if the power supply packs in. Cheap power supplies are also a fire hazard. To find out the make/model of power supply requires opening the case and reading what is written on it. You can then use the make/model as the search term to conduct a web search. I would advise doing that as soon as you receive a new desktop PC regardless of its cost, just in case a cheap power supply is installed. An expensive PC might have originally have had a quality unit that was replaced by staff working at the store with a cheap unit. Micro-ATX motherboards are smaller than full-sized ATX motherboards used in most desktop PCs and so cannot provide as many adapter-card or RAM-memory slots, can be installed in any ATX case, but are usually installed in mini-tower ATX cases. A full-sized ATX motherboard is too large to be installed in a mini-tower (micro-ATX) case. The cases and PSUs reviewed above, tend to be expensive. Amazon is always a good site to visit for PC components because the prices and the purchaser reviews are good. You can do further research on the web for any make/model that appeals to you.